Roasting vegetables is one of the easiest ways to prepare vegetables, not to mention the most delicious. Roasting at a high heat caramelizes veggies, creating such an amazing depth of flavor and natural sweetness that I find completely addictive. 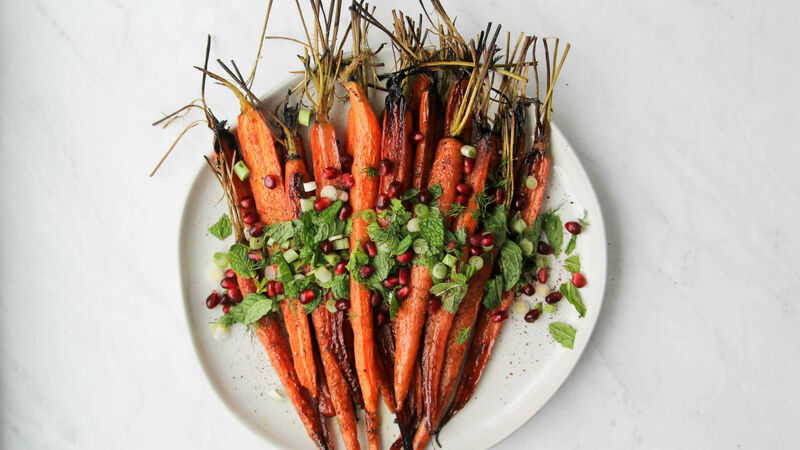 For these pomegranate roasted carrots with sumac, I coat the carrots in pomegranate molasses before roasting. Pomegranate molasses is a really common ingredient used in Middle Eastern kitchens, and is basically concentrated, reduced pomegranate juice that has thickened and becomes syrupy. It is beautifully tart and sweet and can be found in any Middle Eastern grocery store or online. I also love adding pomegranate molasses to roasted chicken and slow-cooked meats like brisket. Since this recipe is all about the carrots, the quality of the ingredients is very important. I always go for the smaller carrots with the tops still attached, if I can find them. They tend to be more tender, less bitter, sweeter, and much fresher than the larger variety in the 5 lb. bags. After the carrots have roasted, just before serving, I shower them with lots of fresh herbs like dill, mint, and scallions, then generously sprinkle ground sumac all over. Like the pomegranate molasses, sumac is another Middle Eastern ingredient that may be new to you. It provides a natural tart, almost lemony flavor that counters the sweetness of the carrots. I finish it all off with some fresh pomegranate seeds on top that turn a simple carrot side dish into an absolute show-stopper. Preheat the oven to 425 degrees F. Peel the carrots, then cut the leaves and most of the tops off, leaving about 2 inches of the stems. 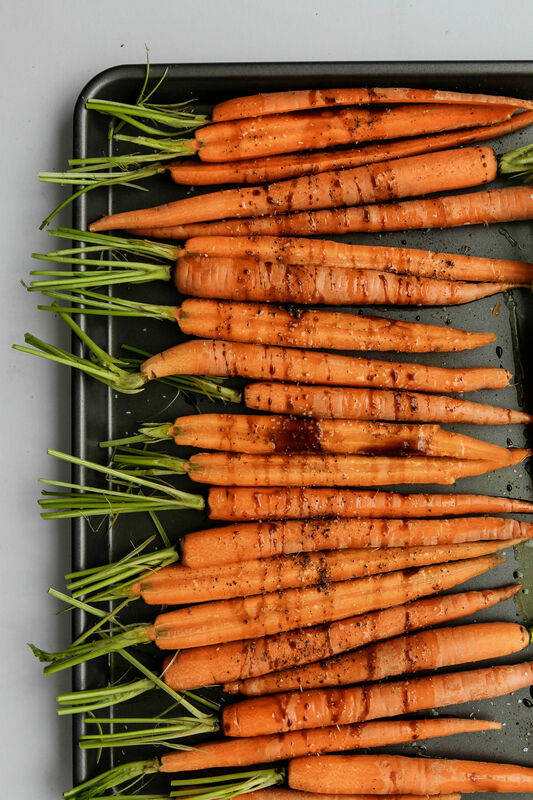 Place the carrots on a large rimmed baking sheet. Drizzle with olive oil, pomegranate molasses, and toss to coat. Sprinkle kosher salt and ground black pepper evenly over all of the carrots. Roast for 30-35 minutes or until caramelized and golden brown on the tops and bottoms. Don’t rush this part! A luscious yet easy lamb stew perfect for the New Year. Nix the mayo and dairy and consider tahini and roasted red peppers as a base for a nutty pasta salad dressing.